I have no idea how common this was. Obviously, there was General Sir Bruce Hamilton, but I've came across a contemporary newspaper report of Colour-Sergeant J. H. Cranch, of Llandilo, who went out to South Africa in March 1902 with the 1st V.B. Welsh Regiment as pay-sergeant, and who had previously seen active service in South Africa in 1880. Another I could nominate was then Lt. Alex Thorneycroft (siege of Pretoria). I will also nominate "Pte. Edward Shaw (Pretoria Carbineers)", later "369 Pte E. Shaw, TMI), (Spion Kop, etc.,) and, later still, member of the F.I.D. Some time ago I submitted a topic "From the Siege of Pretoria to Spion Kop) regarding this very interesting man. 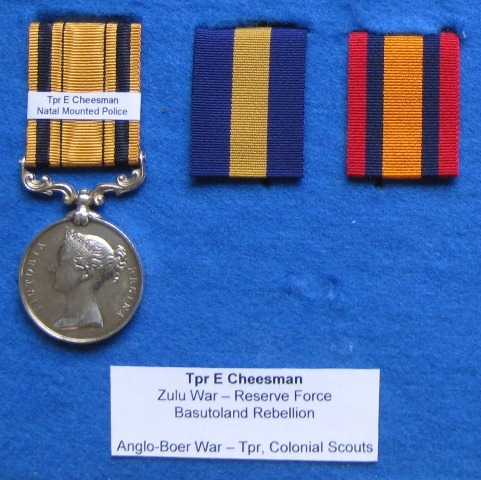 Ebenezer Cheesman, a Zululander, served in the Natal Mounted Police during the Zulu War, he was one of a small NMP contingent that participated in the Basutoland Rebellion, he was with the NMP on Natal's northern border during the 1st Anglo-Boer War, and he then served with the Colonial Scouts during the 2nd ABW, I have only his Zulu War medal. His QSA has been on the market, but not, as far as I know, the CGH GSM. When the war began in December 1880, the Governor of Natal and Officer Commanding the British forces in south-east Africa, Major-General Sir George Colley, had no Imperial cavalry under his command, so a detachment of the Natal Mounted Police was called out to form a mounted presence on the Transvaal border. The NMP remained on active service until 30/3/1881. In keeping with the British tradition of not honouring a defeat, no campaign medal was issued for this conflict, although the NMP OC, Major John Dartnell, was awarded the CMG. "One of the Reserves who has recently gone from Keighley is Anthony Harrison, of Moorhouse Street. He was formerly in the King's Royal Rifles, and was in the Transvaal fighting in 1881 just prior to Majuba, being taken prisoner and conveyed to Pretoria. He had intimated a desire at his regimental depot to be sent to South Africa."